Earth, Air, Fire and Water truly come to life in Elements Slots. There's an exciting avalanche feature, 4 free fall modes and more! Take on the elements in this online 3D slot game today! Try out Elements slots if you want to try something different. Incorporating all four primal elements this slot game features vibrant 3D graphics and a quirky avalanche style feature. There are unique bonuses to be grabbed as the four elements combine across the reels and launch different bonus and games. Each of the four wild symbols has its own free fall mode and there's the chance to win as many as 10 free spins. 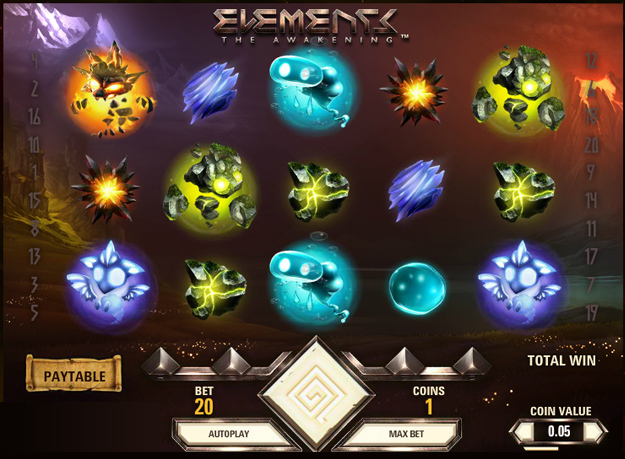 Magical and fun, Elements slots adds something different to your gaming experience.